“Researchers at IIT-Istituto Italiano di Tecnologia developed, assembled and tested a new disaster response robot called the Centauro, a Centaur-like robot consisting of a four-legged base and an anthropomorphic upper body. The robot is capable of robust locomotion, high strength manipulation and harsh interactions that may be necessary during the execution of disaster relief tasks. Centauro is 1.5 m tall, while its shoulder width is 65 cm and its weight is 93 Kg. It is made of aluminium, magnesium and titanium alloys, while cover parts are made from plastic using rapid prototyping fabrication. It is battery-powered and it can operate for 2.5 hours. The robot hardware, its software architecture and whole body control framework were designed and realized at IIT-Istituto Italiano di Tecnologia in Italy by the Humanoid and Human Centred Mechatronics Lab coordinated by Nikos Tsagarakis. The Centauro project aims at the realization of a robotic platform for assisting rescue workers executing emergency response tasks in hostile environments. The Centauro robot is therefore designed to navigate in man-made environments, thanks to its hybrid mobility skills that combine legged articulated locomotion and wheeled mobility. Its body has dimensions compatible to those needed to operate within human infrastructures; it can pass through doors and narrow corridors, and navigate standard stairs. The mobility, manipulation and whole body control skills of the robot have been recently validated in the manipulation of heavy objects and the breaking of wood pieces. Centauro legs incorporate six degrees of freedom, realizing articulated movements in the environment by rotating and extending hips, knees and ankles, and controlling the wheel modules, which are placed at the ankles like rolling “hoofs.” The robot can adopt different configurations, such as the typical leg configurations of quadruped robots, including both inward and outward knee arrangements, and a spider leg configuration, which can be more stable while manipulating powerful tools. Wheels allow the robot to demonstrate wheel-based mobility in addition to the articulated locomotion. The wheels are made of an aluminium alloy with an outer layer over-moulded with an elastomer material, thereby ensuring visco-damped contacts while generating suitable friction when rolling on the ground surfaces. 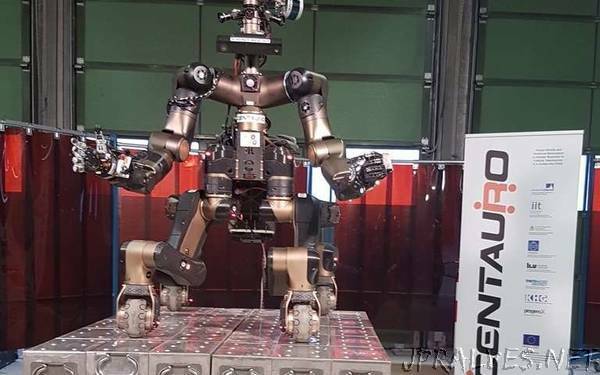 The Centauro robot is capable of using human tools to execute manipulation tasks and can demonstrate manipulation strength capacity that is higher than that of the typical human adult. Its lightweight (10.5kg) arms demonstrate a payload-to-weight ratio greater than 1:1; thus, the payload capacity of the single arm is approximately 11 Kg. Furthermore, its high performance and impact resilient actuation system permits the robot to perform manipulations tasks that requires severe physical interactions without the risk of physical damage to robot components.